Join the discussion on our forums! Come discuss Time Out! over in our dedicated Time Out! discussion topic. An extremely powerful common skill tester. I LOVE it. 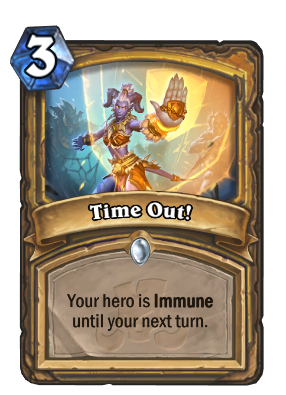 If there is some sort of Control or Combo Paladin, this will be in there. This should be called "Bubble HS", because why not? You probably feel retarded now huh? If this was a priest card Temporus would be viable. This looks worst than Ice Block, but if a Shirvallah - Holy Wrath deck comes out and is playable, maybe you wanna play this card in it. But outside of OTK decks I really don't see this being played. This is really good!! Better than ice block! yes real. Ice block can be removed, this one cannot. It's about time the Immune keyword is used more often. Could be a good if Paladin also good weapon this expansion. For example, this + Grave Vengeance = A free hit on a minion and heal for 5.